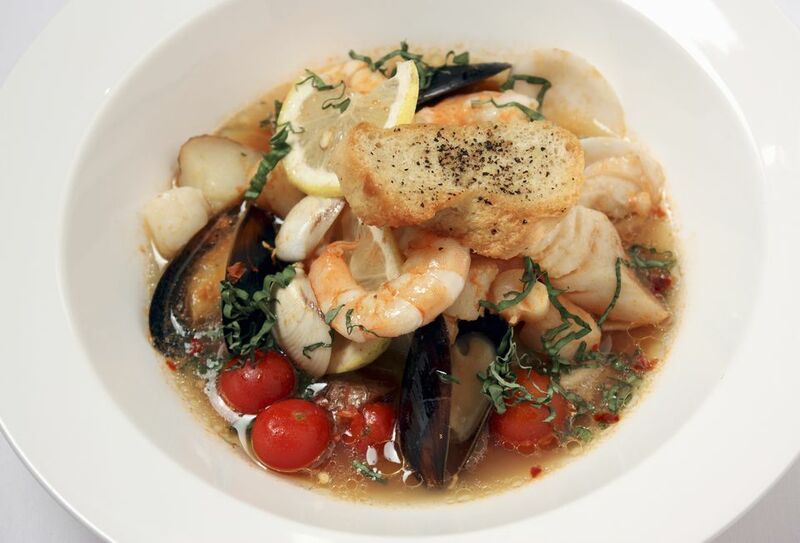 This classic Marseilles seafood stew recipe uses a variety of fish and shellfish, including crab, squid, mussels, and lobster. It is a true seafood lover's delight and while it's labor-intensive, it's worth the trouble. The seafood bones, heads, and shells make the rich bouillon base of the chunky soup. You will need a large stockpot for this recipe. In a large, hot stockpot roast the bones of the rockfish, John Dory, rouget, striped bass, grouper, crab and the lobster heads in the olive oil. Once the bones are opaque, add the onion, celery, carrot, fennel, and garlic. Simmer for 3 minutes, stirring often. Stir in the tomato paste and coat all of the vegetables and bones. Add the pastis and cook until dry. Add the peppercorns, chili pepper, bay leaf, thyme, saffron, and parsley stems, and then add enough water just to cover. Cook until the liquid has reduced by a third. Stir frequently so that nothing sticks to the bottom of the pot. In another large pot run all of the contents of the bouillon through a medium-holed food mill and discard solids. Season the resulting bouillon with salt and pepper. Bring the bouillon to a simmer and add the fish individually based on its thickness (thickest chunks first). Cut the lobster tail through the shell into large pieces. Add the lobster, squid, and mussels to the bouillon. Cook until the mussels open. Bring the pot to the table and ladle into large bowls. Serve with steamed whole baby red potatoes tossed with olive oil and salt and toasted baguette on the side to sop up the juices.